Under this designation may be comprised all the works written by Jews in the Hebrew and the Aramaic tongue. Works written in Hebrew by non-Jews are too few to require consideration here. 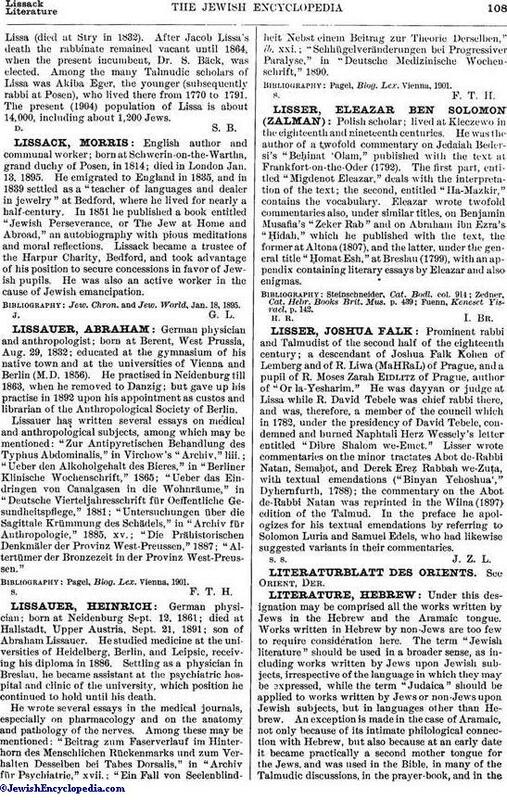 The term "Jewish literature" should be used in a broader sense, as including works written by Jews upon Jewish subjects, irrespective of the language in which they may be expressed, while the term "Judaica" should be applied to works written by Jews or non-Jews upon Jewish subjects, but in languages other than Hebrew. An exception is made in the case of Aramaic, not only because of its intimate philological connection with Hebrew, but also because at an early date it became practically a second mother tongue for the Jews, and was used in the Bible, in many of the Talmudic discussions, in the prayer-book, and in theCabala. Works written by Jews but not upon Jewish subjects and not in Hebrew are treated under the names of their respective authors. See also Judæo-German; Judæo-Greek; Judæo-Spanish. The most significant characteristic of Hebrew literature is that the greater part of it is directly or indirectly the outgrowth of the Bible. There is a marked continuity in the development of the later from the earlier literary forms, all of them going back to the first source—the Bible. In other words, Hebrew literature is chiefly a religious literature, secular writings, produced mostly under the influence of foreign literatures, forming but a minor part of it. It seems, therefore, that, aside from dividing Hebrew literature into periods, as is usually done in histories, it will be best to give a sketch here under the categories into which the Bible itself may be divided, showing what part of the literature may be traced back to the Bible and what must be traced to foreign influence. These categories are "Law," "Prophecy and Wisdom Literature," "History," and "Psalmody." For more detailed information see subjects referred to throughout this article. The Law as a literature has continued its development from the earliest times down to the present day, and has been of greater influence upon the life of the Jews than any other branch of literature. It owes its growth chiefly to the doctrine, long inculcated in the Jewish mind, that along with the written law Moses received also an oral law, which was faithfully handed down by an unbroken chain of teachers and leaders to the men of the Great Synod and by them to succeeding generations. This gave rise to the Talmudic law, or Halakah, which deals, like the Biblical law, not only with man's civil and public life, but also with his private habits and thoughts, his conscience, and his morality. Traces of the Halakah are discoverable even in the Later Prophets, but its period of full development lies between 300 B.C. and 450 C.E. (see Mishnah; Talmud). In the latter half of the fifth century the Babylonian schools declined and the teachers of the Law no longer assumed authority. They confined their teachings to the comparison and explanation of the laws that came down to them from previous generations, allowing themselves to introduce only methodological and mnemonic signs into the Talmud. This sums up literary activity in the line of the Law during the period following the close of the Talmud. See Saboraim. The development of the Halakah in the subsequent period received impetus from the fact that the Babylonian schools once more raised themselves to an important position, owing, perhaps, to Arabic dominion in that country. The Geonim, as the teachers of this period are called, did not produce independent halakah, but continued to promote the study of the Talmud. What the Bible was to the Tannaim and Amoraim that the Talmud became, in its turn, to the Geonim and later teachers. It lay before them as an object of exposition, investigation, and discussion. The succeeding period was one of systematization, condensation, and elucidation; introductions, commentaries, compendiums, and dictionaries were the outcome of the study of the Talmud in those days. A new epoch commenced with the activity of Maimonides. His "Mishneh Torah" embraces the whole field of Halakah, and became an object of much discussion and explanation. In the fourteenth century the halakic literature began to deteriorate, and instead of being the guide of conduct it became a mere play of the intellect. In the sixteenth century, however, it again received a fresh impetus through the Shulḥan 'Aruk of Joseph Caro, which is still the standard work of traditional Judaism. Works on the Halakah are to be found in various forms, viz., in the form of commentaries (Perushim; Ḳunṭresim), glosses (Nimuḳim), additions (Tosefot), novellæ (Ḥiddushim), collections (Liḳḳuṭim), compilations (Ḳobeẓim), compendiums (Ḳiẓẓurim), decisions (Pesaḳim), and judgments (Dinim), as well as in independent codes and responsa. From the prophetic utterances to the preachings and homilies of later days was but a short step, and accordingly public preaching for general instruction and moral edification was instituted among the Jews in very early times. This gave rise to the Haggadah, which did for the spirit what the Halakah did for the practise of Judaism. Just as the Halakah embraces various kinds of law, so does the Haggadah embrace different forms of thought. In a restricted sense, however, the Haggadah may be said to deal with ethics and metaphysics, and it is in this sense that it may be regarded as the natural issue of the earlier prophecies. In its ethical characteristics the Haggadah was greatly influenced by the Wisdom literature of the Bible, but in its metaphysical tendencies it shows the influence of Hellenistic philosophy. To the ethical Haggadah belong a few apocryphal books, such as Ben Sira, the Apocalypse of Zerubbabel, and the Wisdom of Solomon, and the still more important works Pirḳe Abot, Abot de-Rabbi Natan, and Masseket Derek Ereẓ. The metaphysical Haggadah did not develop into a separate literature until a much later date. See Midrash; Targum. About the middle of the eighth century Arabic philosophy began to exercise a strong influence over the Jewish mind, and owing to the rationalistic character of that philosophy the Midrash ceased to grow, and its place was taken by theological and philosophical works of a systematic nature. The prophetic spirit is no longer so clearly discernible as before, owing to the large intermixture of foreign thought, but, on the other hand, the prodigious development of Hebrew literature in the Middle Ages must be ascribed to this foreign influence, for its presence is felt in almost every branch of thought cultivated in those days. It is seen in the rise of Karaism, in the development of philology and exegesis, as well as in the cultivation of general sciences among the Jews. Later, again, when Jewish thought came in touch with Christian mysticism, the developed Cabala sprang into existence in place of the metaphysical Haggadah (see Cabala). Finally, a great part of the large controversial literature owes its existence to the conflict between Judaism and Mohammedanism. The theological literature previous to the twelfthcentury is very fragmentary, and consists mostly of partial translations from the Arabic. Though the beginning of this literature dates from the days of Saadia Gaon, there is no independent work of the kind in Hebrew until a much later date, and even the earliest among the prominent men in this field, Ibn Gabirol (11th cent. ), Judah ha-Levi and Maimonides (12th cent. ), wrote in Arabic, as had Saadia. The first important theological writers in Hebrew were Levi ben Gershon (14th cent. ), Joseph Albo (15th cent. ), and Elijah Delmedigo (15th cent.). The ethical literature was continued in the works of Gabirol and Baḥya ben Joseph (11th cent. ), Halevi (12th cent. ), Isaac Aboab and Eleazar ben Judah (13th cent. ), Jedaiah Bedersi (14th cent. ), Leon of Modena (16th cent. ), and Moses Ḥayyim Luzzatto (18th cent. ), as well as in the large literature of ethical Wills and correspondence current throughout the Middle Ages. 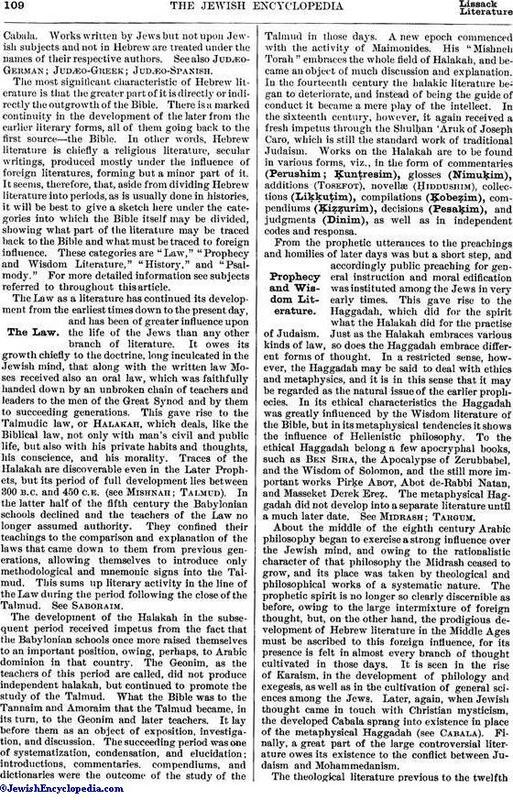 The metaphysical Haggadah assumed under the influence of Arabic philosophy the aspect of a systematic philosophy, and through the influence of Christian mysticism it became a sort of theosophy which looked for the hidden and disregarded the evident meaning of the Law, and which, under the name of Cabala, began to develop an extensive literature, first in Italy and in Provence, and later in the East. The founder of the Cabala was R. Isaac the Blind (12th cent. ), who was followed, in the thirteenth century, by a host of eminent scholars. To the same century undoubtedly belongs the most famous cabalistic work, the Zohar, which is ascribed by all critics to Moses de Leon. The cabalistic literature of the fourteenth and fifteenth centuries is mostly anonymous and not original. But a new epoch opens with the teachings of R. Isaac Luria in the sixteenth century. He inaugurated the "practical" Cabala. No longer content to be restricted to the world of thought, this Cabala assumed to interfere in the world of action and to direct man's conduct in life. Luria's chief disciple was Ḥayyim Vital, who committed the teachings of his master to writing. In the latter part of the seventeenth century this "practical" Cabala was at the root of the Shabbethaian movement, and in the eighteenth century it was the cause of the extravagances of the Ḥasidim, the chief of whom were Israel Ba'al Shem, Bär of Meseritz, and Salman of Liadi. With the rise of systematic theology there came into existence an extensive literature of controversy. For although traces of this literature may be found in the Talmud, it was not until Judaism came into conflict with its two sister religions and with Karaism that religious controversy became a significant part of Hebrew literature. The first great work of this kind is the "Cuzari" of Judah ha-Levi, which is directed mainly against Mohammedanism and Karaism. But the most fruitful period for religious controversy was the fourteenth and fifteenth centuries, and the leading authors of that period were Profiat Duran, Joseph Albo, Isaac Abravanel, and Yom-Ṭob Lipmann Heller. In the sixteenth century two strong polemics were written against Christianity: the "Hoda'at Ba'al Din" of Joseph Nasi and the "Hizzuḳ Emunah" of Isaac ben Abraham Troki. In modern times Isaac Baer Levinsohn wrote many controversial works. Another product of the influence which Arabic philosophy exerted over Judaism is Karaism. It took its origin in the latter part of the eighth century and came early under the influence of Mohammedan dogmatism. Its literature dates from the same period, and consists mainly of dogmatics, exegesis, and grammatical works; its most prominent authors are: Judah Hadassi (12th cent. ); Aaron the Elder (13th cent. ); Aaron ben Elijah, author of "'Eẓ ha-Ḥayyim" and "Gan 'Eden" (14th cent. ); Elijah Bashyaẓi (15th cent. ); and Zarah Troki (17th cent.). In the nineteenth century the most prominent Karaite scholar was Abraham ben Samuel Firkovich. To the influence of Arabic literature must be ascribed also the scientific development of Hebrew grammar, which in turn greatly affected Biblical exegesis; both form important branches of Hebrew literature, but they can not be discussed here. "The meager achievements of the Jews in the province of history do not justify the conclusion that they are wanting in historic perception. The lack of Jewish writings on these subjects is traceable to the sufferings and persecutions that have marked their path. Before the chronicler had had time to record past afflictions, new sorrows and troubles broke upon them" (G. Karpeles, "Jewish Literature, and Other Essays," p. 23). Though real historical works, in the modern sense of the term, are a very late product in Hebrew literature, the elements of history were never absent therefrom. The traditional nature of the Halakah created a demand for chronology and genealogy, while the Haggadah often enlarged upon the historic material of the Bible for purposes of its own. The most important historic documents of the Talmudic period are the Seder 'Olam Rabbah (1st cent.) and the Megillat Ta'anit (2d cent. ; though in its present state, however, perhaps the product of the eighth century). From the geonic period there are a number of historic documents, e.g., Seder 'Olam Zuṭa, Seder Tannaim we-Amoraim, and the Letter of Sherira Gaon. From the tenth century there is the "Yosippon," and from the eleventh the "Sefer ha-Ḳabbalah" of Abraham ibn Daud. Besides these there are some notable books of travel to be mentioned, as the "Sefer Eldad ha-Dani" (11th cent. ), the "Sibbub Rab Petaḥyah" (12th cent. ), and the "Massa'ot" of Benjamin of Tudela (12th cent.). The fifteenth, sixteenth, and seventeenth centuries produced notable chroniclers like Solomon Ibn Verga (15th cent. ), Abraham Zacuto (16th cent. ), Joseph ha-Kohen (16th cent. ), David Gans (16th cent. ), David Conforte (17th cent. ), and Jehiel Heilprin (17th cent.). Azariah dei Rossi (16th cent.) may be regarded as the first critical literary historian, and his work is authoritative even to-day. In the eighteenth century Ḥayyim Joseph David Azulai is the most prominent literary historian, while in the nineteenth century the chief works on history and the history of literature are those of Rapoport, Schorr, I. H. Weiss, Frankel, and Isaac Halévy. See Historiography. The literature devoted to the liturgy of the Synagogue extends over a long period. Although in the Bible there is no mention made of any composition specially written for the purpose of prayer, it is not unlikely that many Psalms were recited in the Temple service and then adopted as prayers. And inasmuch as the oldest prayers are largely mosaics, made up of quotations from the Scriptures, the liturgy may justly be regarded as a development of the Psalm literature. It was due to this Biblical origin also that the language of the old prayers was in most cases Hebrew and the style fluent and forcible. The later development of the liturgy, however, was closely connected with the development of the Midrash. This is evident from the fact that the additions which grew up around the old nucleus of the prayer were in the spirit of the Midrash, until finally the Midrash itself entered into the liturgy. Under the influence of the new forms of poetry in the Arabic period the daily prayers, and still more those of the festivals, assumed various forms. Liturgical poems adapted for special occasions were produced and new technical names invented. By degrees even dogmatic theology and halakah were versified and introduced into the liturgy. The important occasions of life—birth, marriage, and death—were made the subject of synagogal poetry. The literature of the liturgy is so large that no attempt is made to record names. It will be sufficient to state that although a skeleton of much of the ritual was already fixed in Talmudic times additions to it were made as late as the sixteenth century. See Liturgy; Piyyuṭ. From religious to secular poetry is but a step, yet it was only in the middle of the tenth century that secular poetry began to flourish. In this as in other branches of literature, Arabic influence was strongly felt from the days of Ḥasdai (10th cent.) down to those of Immanuel of Rome (14th cent.). 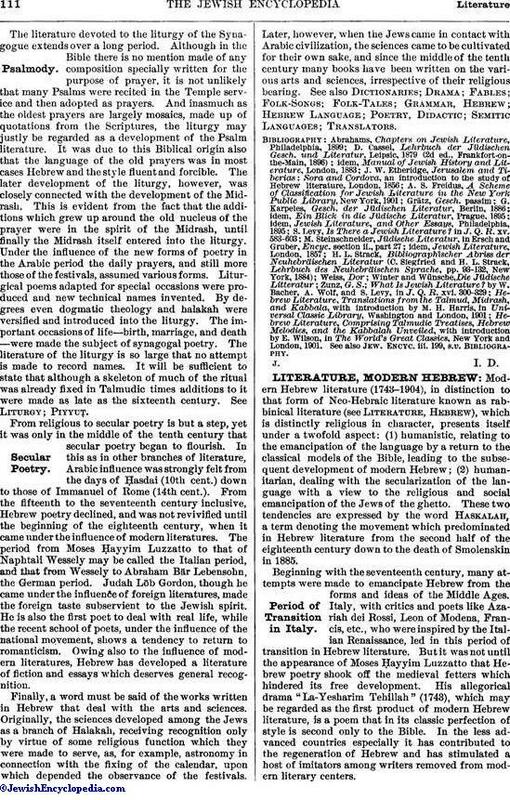 From the fifteenth to the seventeenth century inclusive, Hebrew poetry declined, and was not revivified until the beginning of the eighteenth century, when it came under the influence of modern literatures. The period from Moses Ḥayyim Luzzatto to that of Naphtali Wessely may be called the Italian period, and that from Wessely to Abraham Bär Lebensohn, the German period. Judah Löb Gordon, though he came under the influence of foreign literatures, made the foreign taste subservient to the Jewish spirit. He is also the first poet to deal with real life, while the recent school of poets, under the influence of the national movement, shows a tendency to return to romanticism. Owing also to the influence of modern literatures, Hebrew has developed a literature of fiction and essays which deserves general recognition. Finally, a word must be said of the works written in Hebrew that deal with the arts and sciences. Originally, the sciences developed among the Jews as a branch of Halakah, receiving recognition only by virtue of some religious function which they were made to serve, as, for example, astronomy in connection with the fixing of the calendar, upon which depended the observance of the festivals. Later, however, when the Jews came in contact with Arabic civilization, the sciences came to be cultivated for their own sake, and since the middle of the tenth century many books have been written on the various arts and sciences, irrespective of their religious bearing. See also Dictionaries; Drama; Fables; Folk-Songs; Folk-Tales; Grammar, Hebrew; Hebrew Language; Poetry, Didactic; Semitic Languages; Translators. 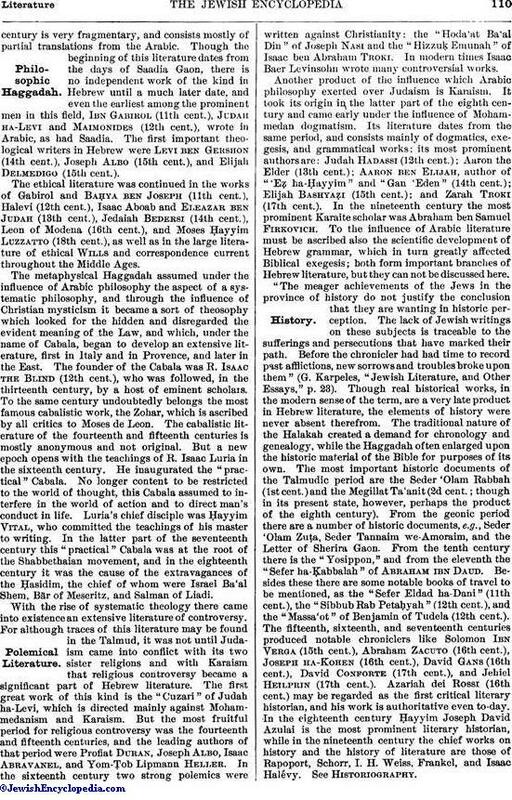 Hebrew Literature, Comprising Talmudic Treatises, Hebrew Melodies, and the Kabbalah Unveiled, with introduction by E. Wilson, in The World's Great Classics, New York and London, 1901. See also Jew. Encyc. iii. 199, s.v. Bibliography.